I’m 11 years old TODAY. 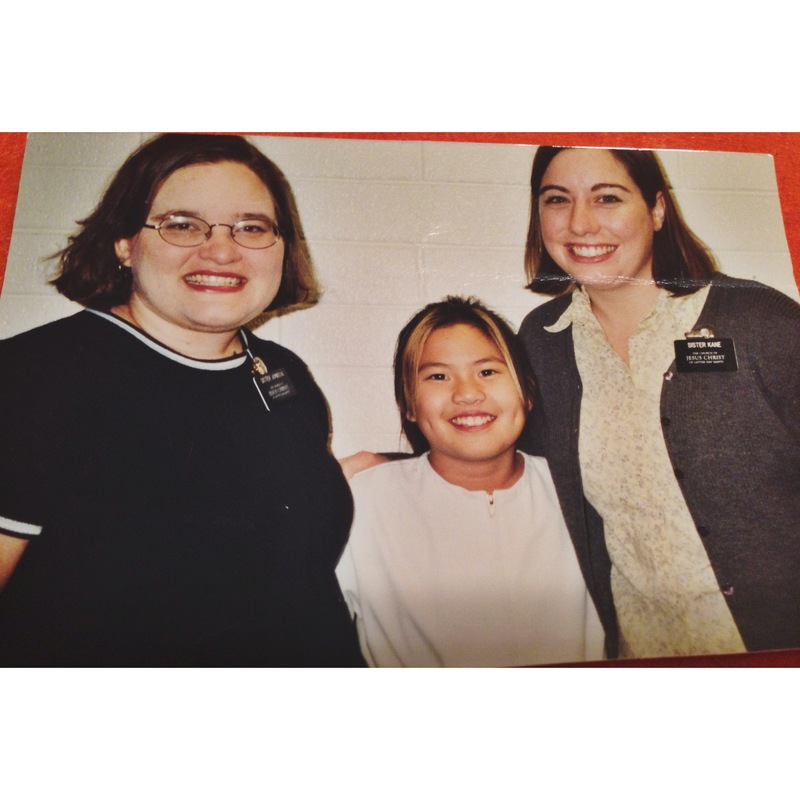 Today marks the 11th anniversary of being baptized into the Church of Jesus Christ of Latter-day Saints! TIME FLIES! Today is a very special day for me because this Church that I belong to, has made a MAJOR impact in my life. Most of you know about my conversion story, but for those that do not – here you go. I went to Achievement Days and there were all these girls my age. Lots of white people. I was definitely the minority. We met in someone’s house -Sister Taggard’s house! That day was my first time ever experiencing what service was. We made this delicious homemade pizza. We baked it and I was sooooo ready to eat it! Then… Sister Taggard said: “Now we are going to deliver it!” WHAAAT? Give it away? We just made it and I’m hungry!! hahahah But, it was for an elderly woman in the ward. So that was pretty rad. The next day, I went to my other neighbor’s house (The Casutt’s) and I normally play with them everyday because Zach was only 4 years younger than me. We would always play Nintendo 64, jump on his trampoline, play house and do whatever kids did in the late 90s and early 2000s hahahaa. I never knew they were LDS. The next day after that service activity, I told Nana (Sis. Casutt) that I went to a “Mormon” thing. She then said “OH, we are Mormon too!” REALLLYYY?? I always wondered why they never said anything the past few years to me. When she told me, she then invited me to church with them on Sunday. I first was hesitant because I had to wear a dress/skirt and I was a tomboy back then so that almost scared me away. But, I said yes! The next Sunday, I went to church and saw all of those girls from Achievement Days! I liked the familiarity with everyone. Also, everyone was so kind to me and became friends with me instantly. I went to Sunday School and Primary and sang a ton of songs. 3 hours of church didn’t feel long to me because everything I was learning was new and exciting. My new friends were exciting! I remember getting back into the car and Nana asked me how I liked it. I said it was really cool and those girls are super nice. She then asked if I wanted to speak with the sister missionaries. I said “sure!” Then she said, “We’ll have to ask your mother for permission because you are young.” I was fine with that. We were basically family friends so I wasn’t scared for her to ask my mom. Luckily, my mow as cool with it! She said, “as long as it’s free and it won’t hurt her!” hahahah my mom is so cheap. The next couple of days, we scheduled missionary discussions with Sister Johnson and Sister Kane. They were super nice and I never felt nervous. I was just trying to take everything in with what they were teaching me. I knew there was a God and I knew people went to church, but I never thought about baptism or belonging to just one church. I think at the 2nd discussion, the missionaries pulled out a calendar and they asked me when I wanted to be baptized. I chose October 14th, 2003 because it was a Tuesday and that’s when my mom didn’t have work. The date was scheduled and it just felt right. In preparation for my baptism, the missionaries wanted me to pray often asking if it’s the right thing to do. I don’t remember getting a clear answer but I know that I felt happy whenever I was surrounded by church members. Those girls at achievement days became my best friends from middle school and all they ways past high school. My baptism day was absolutely perfect. Except for when I came out of the dressing room feeling choked by my baptism jump suit. I figured out that I put it on backwards cuz who knew the zipper was supposed to go in the front hahaha minor problem but it was definitely fixed. I loved loved loved that my mom took the time to come. She knew it meant a lot to me. Well, there’s my conversion story everyone. 11 years has passed and it’s crazy how much I have changed. My life has been tremendously a BETTER life by being a member of this wonderful church. The gospel makes me the happiest and positive person. I have faith that things will work out. We are not all perfect and our lives will never be perfect but we can always strive to be our best selves. Shout out to everyone who has been by my side all these years. I could not have done this all alone. I’m grateful that my family has been so supportive when they don’t really have any clue what’s going on. I’m thankful that I could attend BYU and be with people who have the same standards as me. It’s been a great life and I’m sooo stoked for what the future holds for me.